Various locations. Please consult the Google map daily. 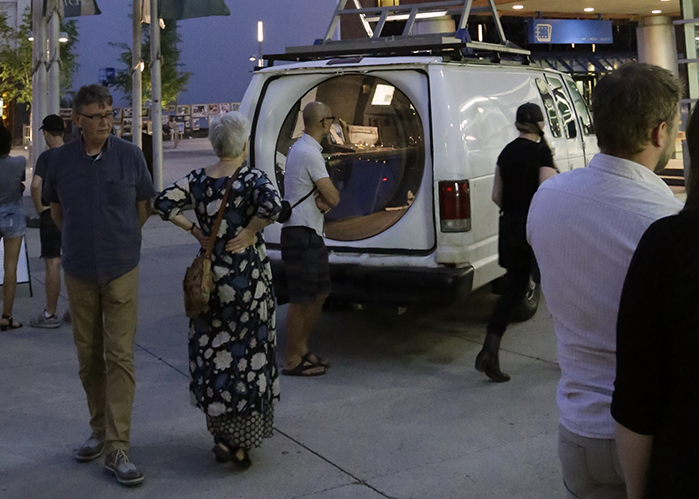 For CAFKA 2015 MAW collective is installed a surveillance van. The van will not be surveying its surroundings or the park goers, but is intended to make people question its operation and their role within the greater surveillance machine that is currently being debated on all types of public media. "Through the windshield and front windows of the van the audience can see a modified dash that undulates into an organic form. Cup holders and cups are scattered everywhere like mushrooms growing on a log. Debris clutters everything and a fine layer of dust paints everything a nicotine stained yellow over the grey scale of the consul, it is evident that eons of time has been spent there. A wall behind the driver's seat partitions the two installation views. A vent grate is mounted to the partitions wall, when looked at through the right angle light can be seen from behind it. On top of the van a scissor lift, reminiscent in design of a cell phone tower, mechanically raises the main satellite into the air. The satellite borrows its aesthetic from civic park benches, even holding a sapling in the middle of of a circular seat. This satellite when erected provides a physical mode of surveillance in being high enough to better view the surrounding area. Where the van's back doors should be, a large plexiglass dome replaces them serving as the audience's main vantage point when viewing the van interior. Inside, the glow of screens illuminates the standard office grey carpet that encases the van's technological consuls insulating the van from sound. Four screens amidst the technological array will play site specific video that shows Bigfoot intervening in the everyday life of Kitchener and the surrounding area. The videos will share a quality with the ambiguous, low-quality Bigfoot footage found online, fuzzy and mysterious in the clumsy shots. These videos will be inter-spliced with live feeds from two locations on the van, one from the top of the tree in the middle of the surveillance bench and one from the side doors of the van which the audience will strain to see through the tinted glass. The interior will also be host to many surveillance tools, some obscure and others baffling as to what purpose they could possibly serve. They are fashioned crudely, like a neolithic tools cosmetically changed to appear to have a modern function. Somewhere in the van a Bigfoot costume is folded neatly. “Untitled white van” is a proposition, an allegory for the contemporary zeitgeist. At the crux of this sculpture is a discussion surrounding surveillance. MAW is not interested in didactically painting victims and predators, we are interested in active participation in the discussion about the future of our cultural and physical landscapes. There are clues that in fact Bigfoot is the surveyor occupant of the van. The mythological creature that has been spoken about for centuries eluding humanity's gaze is now keeping tab on the art world. The scissor lift on top of the van is reminiscent of spindly cell phone and power line towers, while the bench on top is the van's main satellite. The circular bench borrows its shape from satellite dishes and UFOs. Indeed it is another surveillance platform from which the surveyor can see further, being high up, but it also suggests that civic comforts sometimes orbit secretive and possibly sinister philosophies. The young tree on top of the platform with the bench also provides a civic or park atmosphere, while implying that this conversation is still young, with time enough to grow." Craig Spence, Max Evans, Simon Zaborski, John Gunner, Jackson Darby, and Gabriel Baribeau formed MAW in Montreal in 2011. MAW makes sculptures and installations that transcend time and space. MAW collective’s work is made for the future, inspired by the past and represented in the present. Recent solo exhibitions include “Borjira,” Astro Turf, Vancouver (2015); “Nobody Will Believe You Didn’t Want What I Mad,” Galerie CK2, Montreal (2015); “Deflective Skepticism and Critical Plinking,” Parisian Laundry, Montreal (2014).